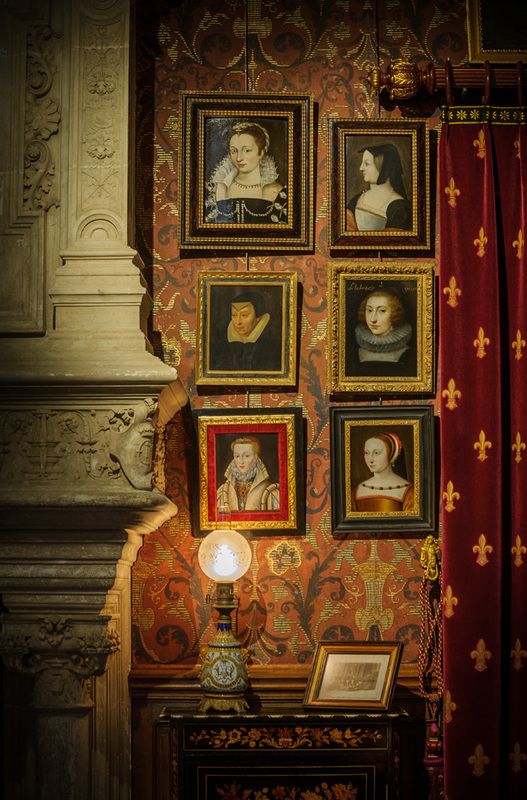 The ground floor has been restored to its 19th century state when the castle was owned by the Marquis of Biencourt This is mainly to highlight the occupation of the château by Anne-Elie Marie de Montmorency (1803-1882) and Armand-Marie-Antoine de Biencourt (1802-1862). This refurnishing is based on significant research work: the archives enable us to know what furniture was owned by the successive owners of the château. From these documents, furniture, as close as possible to that described, is acquired and placed in the château. The Biencourt Salon before refurnishing. 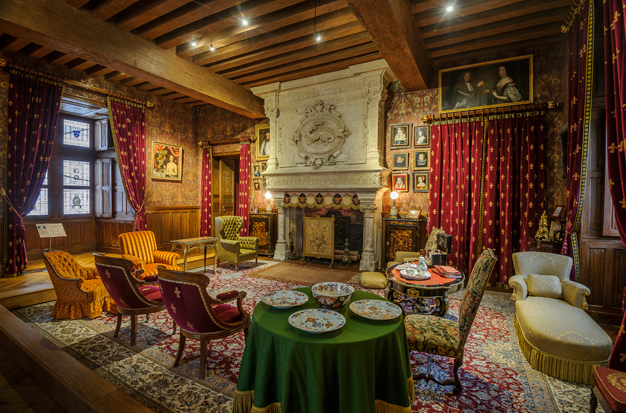 The Biencourt Salon is the centrepiece of this apartment: it illustrates the taste of the owners for the Renaissance and gives the château a new magnificence. This lounge has partially preserved its neo-Renaissance interior décor, designed around a large fireplace, adorned with panelling, lined with leather-patterned wallpaper and covered with a painted joist ceiling. Thanks to the exceptional support of Mobilier National, the Centre des monuments nationaux aims to recreate the special atmosphere of this luxurious and comfortable lounge. The curtain and mantle runner are particularly well documented and thus faithfully reproduced. Reconstruction of the historic state of the second half of the 19th century with furniture brought in by Mobilier National. 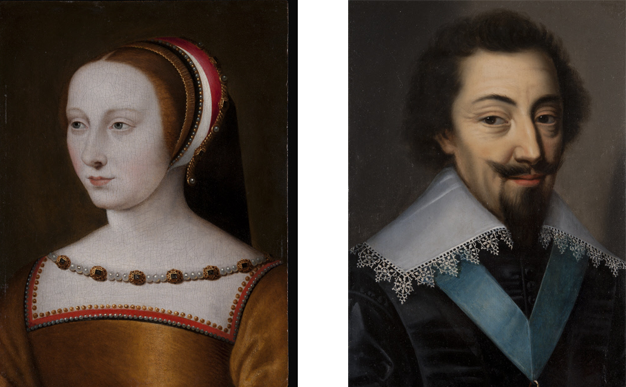 The Biencourt family had an extraordinarily rich collection of historical portraits of over 300 works dating from the Renaissance, the 17th and 18th centuries. Admired from the mid 19th century, this collection presented a real history lesson. 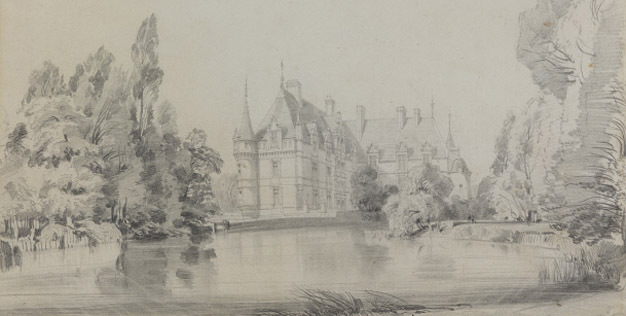 Fifty pieces are now in the Musée Condé in Chantilly. It is impossible to return all of this collection to Azay. Acquisitions and the addition of similar works will help to recover the spirit of the collection. 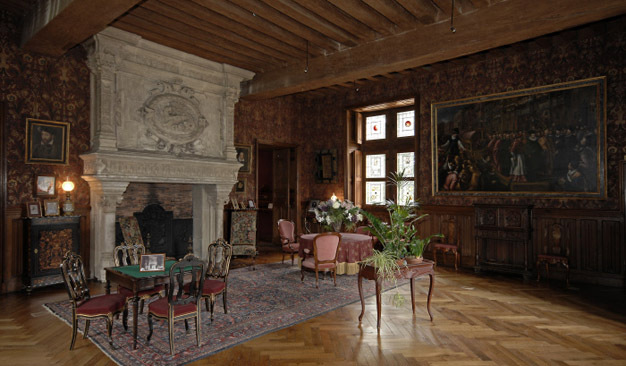 Thus, the château keeps its museum character alive marked by historicism and the rediscovery of Renaissance art. Built in 1856 by Edmond Lechevallier-Chevignard in neo-Renaissance style, it illustrates the work undertaken by Armand François Marie de Biencourt and then by his son Armand, to give the château stylistic unity. The mantelpiece bears a sculpted decoration of leather cut out patterns. In the centre appears the symbol of Francis I, the Salamander, which is also found in the decoration of the château. In the 19th century the fireplace was painted: it has since lost its colours.